Dr. John Walker is the 2018 Washington-Nile Alumni Hall of Fame recipient. He graduated from Washington High School as Valedictorian in 1955. Dr. Walker then graduated from McMicken College of Arts and Sciences, receiving honors with a B.A. in zoology. After graduating from McMicken, Dr. Walker attended the University of Cincinnati, College of Medicine where he received his physicians doctorate. He had a private practice in urology from 1968-1999. During this time he served as Chief of Staff at Mercy Hospital in 1973-1974, and served on the hospital's Board of Trustees from 1975 until it's merger with Scioto Memorial Hospital. He was also president of the Scioto County Medical Society in 1991. Certified by the American Board of Urology in 1972, he is also a member of the American College of Surgeons continuing with a senior membership to present day. In the community, Dr. Walker has been a member of the Portsmouth Rotary Club since 1968. 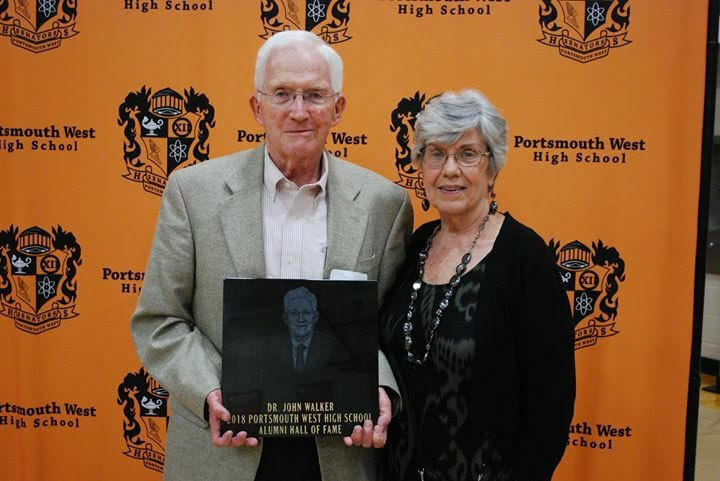 He served as team physician for Portsmouth West from 1968-1982 and then at Portsmouth High from 1983-1999. He was awarded the Ohio Outstanding Team Physician Award in 1995 by the Ohio State Medical Association and the Ohio High School Athletic Association. Dr. Walker was honored with star on the Portsmouth flood wall in 2000, and received the Outstanding Physician Award in 2005. Congratulations Dr. Walker in all of your outstanding achievements and awards and in being a 2018 Washington-Nile Hall of Fame recipient!